"Just Us Girls" Challenge provided us with a template from Mirkwood Designs this week. I've decided to join in on Polka Doodles-Boy's Birthday by making this a big boy's birthday, we do love it when those big boy's grill. My color choices are from Tuesday Throwdown-Black, White and a Splash of Color. I was given a big pack of this red gingham paper by a generous friend and this apron just begged to be made out of red gingham. All the "quote" stamping on this project is created in My Digital Studio. I think that would be considered digi stamping, still getting used to the digi world. 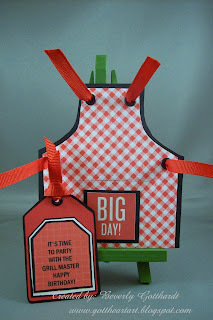 The Big Day, and the tag on tag with the sentiment(from only ovals stamp set) and riding hood red grid paper were created in MDS printed off and cut out. I hardly ever use eyelets, but I broke out my Crop-A-Dile and set 5 on this project, quick and easy. Supplies: Template from Mirkwood Designs, Papers-CTMH-red gingham, Stampin Up-Basic Black, white and red card stock from scrap box, Stamps-MDS, black eyelets-Jo-Ann's, ribbon-Offray. What a fun template. Your project looks great and I love the splash of red. Thanks for playing along with us at Tuesday Throwdown. What fun! The perfect BBQ card! Nice job and thanks so much for playing along with JUGS! Great BBQ card - fun papers and colors. Thanks for playing along with Just us Girls this week. What a fun card Beverly it reminds me of a 4th of July cookout! Love the plaid! Oh my goodness! SO true! I love the red gingham for this project! Thanks so much for sharing this with Just Us Girls! Adorable! I love the shape - prefect for a summer BBQ! Thank you for joining us at Tuesday Throwdown! Great apron card! LOVE the red gingham...I agree, it was perfect! Thanks so much for playing with Just Us Girls! How fun is this?!?! Awesome apron card - so festive! Love the patterned papers :) Thanks so much for playing along with Just Us Girls! I love this template! what a fab card! thank you for playing along with us at polka doodles! Fantastic! Thanks for playing along with TT! Love the apron shape. Thanks for playing the Polkadoodle Challenge…hope you had fun.